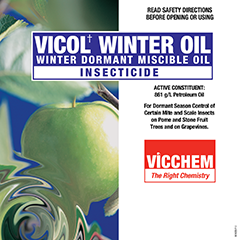 Vicol Winter Oil is a Miscible "clear" oil product that is used to control certain pests in horticultural situations. Control of pests in orchards by VicolTM Spray Oils is generally achieved by death primarily through suffocation. Death may also result from interactions between oil molecules and insect fatty acids and interference with feeding and excretion. Sprays are generally more effective on smooth than on rough surfaces. VicolTM Spray Oil deposits can also prevent settling of scale crawlers and by repellency, reduce the number of eggs laid. Vicol Spray Oils can be applied to Citrus, Stone & Pome Fruit, Grapes, Tropical and other fruits to treat the pests in the Table in the attached Product Information Sheet. 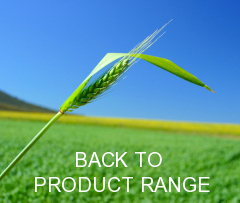 For specific details on rates, crop, pest, timing and uses with other products refer to the product labels.